The VC, Prof. Olusola Oyewole (Left) receiving the ITF Abeokuta Area manager, Mr. Abayomi Ososona who paid him a courtesy visit recently. The Area Manager, Industrial Training Fund (ITF) Abeokuta Area Office, Mr. Abayomi Moses Ososona, has paid a courtesy call on Professor Olusola Bandele Oyewole, following his appointment as Vice-Chancellor of the Federal University of Agriculture, Abeokuta. During the visit, Mr. Osasona highlighted the mandate of the ITF which focuses on Human Capital Development and Students’ Industrial Work Experience Scheme (SIWES) administration in Nigeria. According to the Area Manager, the Fund was established in 1971 under the enabling Act 47, as amended under the Act 19 Laws of the Federation of Nigeria, in 2011. He said that the provision includes the mandate of providing, promoting and encouraging the acquisition of skills in industry and commerce as well as generating a pool of indigenous manpower, sufficient to meet the needs of the private and public sectors of the economy. Mr. Osasona said that in the four decades of ITF’s existence, it had not only raised training consciousness in the economy, but had also helped in generating a crop of indigenous skilled manpower in diverse sectors of the economy. 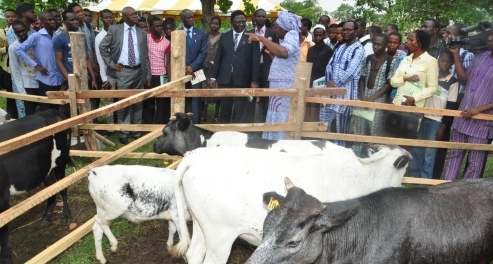 On some of the achievements of the Fund, the Area Manager said it had been able to provide training skills in Management for technical and entrepreneurial development in the public and private sectors of the economy, while it had also set training standards, monitoring adherence, as well as carrying out evaluation and certification. Responding, the Vice-Chancellor, Professor Olusola Oyewole described ITF as vital to the industrial need of the nation in the area of capacity development.